Metropolitan Operaâs High Definition broadcast of Mozartâs musically acclaimed opera, âDon Giovanni,â will be Saturday, Oct. 22 at Colorado Mountain College, Breckenridge. 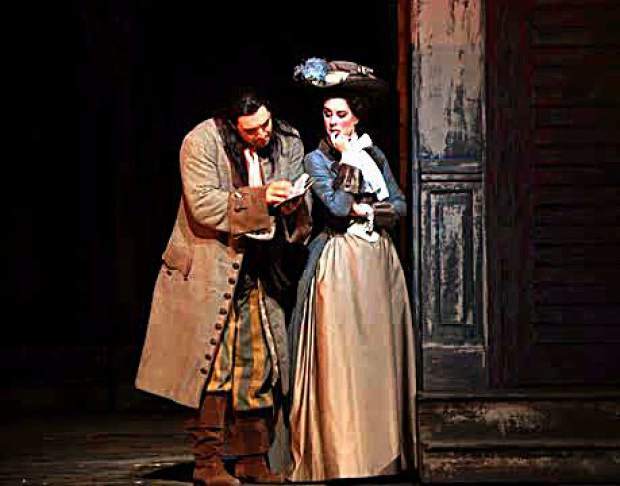 When: Saturday, Oct. 22; 10:55 a.m.
Mozart’s musically acclaimed opera, “Don Giovanni,” will be the Metropolitan Opera’s High Definition broadcast on Saturday, Oct. 22 at 10:55 a.m., at the Colorado Mountain College, Breckenridge. The premiere of the “Don Giovanni” opera performance was at the National Theater (now Estates Theater), Prague, in 1787. Mozart approached his operatic retelling of the Don Juan myth from a point of view that is neither tragic nor entirely comic, but rather lighthearted and ironic. Mozart originally set his opera in the city of Seville in southern Spain, already famous in his time as a mythical world of winding streets, hot-blooded young men and exotically beautiful women sequestered behind latticed windows. This production places the action in an unnamed Spanish city in the mid-18th century. Act I opening scene is at night, outside the Commendatore’s palace in Seville. Leporello, Giovanni’s servant, is grumbling about the fatiguing duties required in attending to his master. The Commendatore’s daughter, Donna Anna, next appears being pursued by the masked Giovanni, who had entered her chamber attempting seduction. Anna’s father, hearing her cries, arrives on the scene. In an ensuing duel, Giovnni kills the Commendatore. Anna, in search for help, returns with her fiancé, Ottavio. Upon finding her father dead, insists that Ottavio swear vengeance on the assassin. In the next scene, Giovanni encounters one of his former conquests, Donna Elvira, complaining about his betrayal of her. Leporello, in his famous “catalogue” aria, sings that she is neither the first nor the last woman to fall victim to this paramour. From a catalogue, Leporello vocalizes the names of several women Giovanni had seduced. In the following scene, peasants are seen singing and dancing in celebration of the marriage of Masetto and Zerlina. As might be expected, Giovanni flirts with the bride, telling her she would be destined with himself to have a better life. Anna, Elvira and Ottavio appear masked and, unrecognized, had been invited in by Leporello. Donna Anna, in overhearing Giovanni’s voice, recognizes him as the murderer of her father and is devastated. The three then unmask and accuse Giovanni, who in recognizing the plot, quickly departs. In Act II, Leporello exchanges disguise with Giovanni, providing him with opportunities to pursue other women. Under this disguise as Leporetto, Giovanni diverts an armed group in different directions, retaining Masetto to confide a “secret,” but instead thrashing him. Zerlinda returns to nurse her bruised sweetheart back to health. It will be of interest for those attending this 100th HD production by the Met to experience how the stage manager, Michael Grandage, interweaves the five separate scene changes that occur in each Act. The orchestra, led by conductor Fabio Luisi, promises to be at its best. Pizzas, snacks and beverages will be served for $5 donation during the single intermission. Elmer Koneman is a volunteer and opera enthusiast.